Herefordshire (/[unsupported input]ˈhɛrᵻfərdʃər/) is a historic an ceremonial county in the Wast Midlands region o Ingland. For Eurostat purposes it is a NUTS 3 region (code UKG11) an is ane o three coonties that comprise the "Herefordshire, Worcestershire an Gloucestershire" NUTS 2 region. It an aw forms a unitary destrict kent as the Coonty o Herefordshire. It borders the Inglis ceremonial coonties o Shropshire to the north, Worcestershire tae the east, Gloucestershire tae the sooth-east, an the Welsh preservit coonties o Gwent tae the sooth-wast an Powys tae the wast. Hereford is a cathedral ceety an is the coonty toun; wi a population o approximately 55,800 inhabitants it is an aw the lairgest settlement. 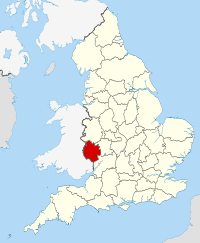 The coonty is ane o the maist rural an spairsely populatit in Ingland, wi a population density of 82/km² (212/sq mi). The land uise is predominantly agricultural an the coonty is well kent for its fruit an cider production, an the Hereford cattle breed.